We were in Stratford last weekend to catch a fantastic production of The Importance of Being Earnest, the kind of production that makes you wonder if there's anything in the world quite as delightful as an Oscar Wilde comedy. Well, of course there are those delectable Vancouver cupcakes so I might just have to call it a tie. But anyway, while in town for the day we stopped into Quark Soup on Ontario Street, a shop that sells all kinds of weird and wonderful goodies like Sea-Monkeys and Insta-Snow. 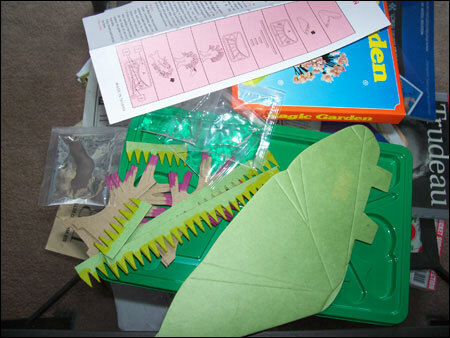 A bizarre looking Magic Garden kit caught our eye. 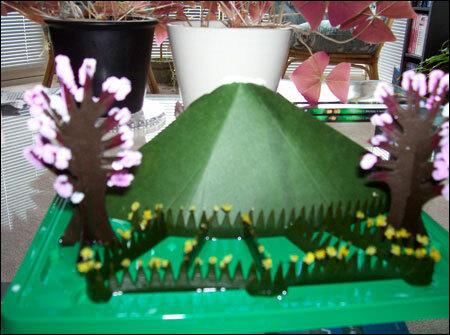 The box promised that once watered with the enclosed MAGIC solutions the paper garden would begin to blossom within three hours. In just ten it would be fully grown. Really? How the hell does that happen? 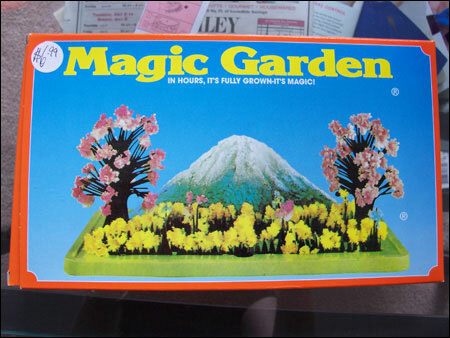 I'm no wiser now, having purchased the Magic Garden, and the box (which lists the product as being made in Taiwan) doesn't give any ingredients away. So I guess I just have to believe in the power of magic. Below you can examine my photographic evidence, taken on Canada Day when we had a day to spare to study the progress of our Magic Garden, in between watching snippetsfrom Corner Gas and Trailer Park Boys marathons. Magic Garden—the promise of whimsy and wonder for $6.99. 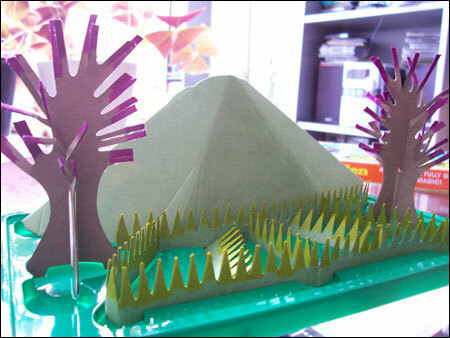 The Magic ingredients, including paper cut-out trees, flowers, mountain and the packets of Magic solution. 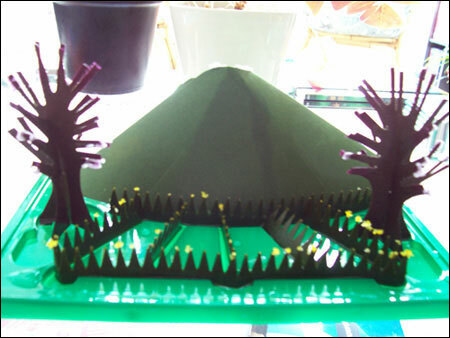 The instruction sheet mentioned a blue mountain, while ours was clearly green, but we soldiered on. Assembled, the Magic Garden awaits the Magic solution which will transform it from a barren wasteland to a thing of beauty. About an hour after the application of Magic Solution, the flowers and trees already showing some evidence of growth. 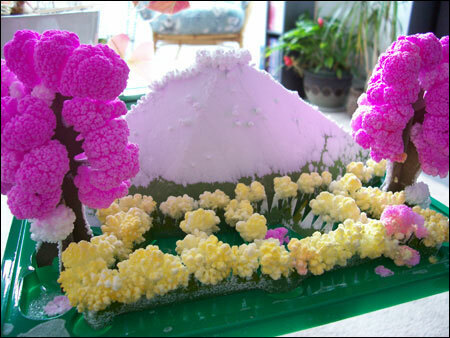 Approximately three hours into the process, pink blossoms sprouting on trees. Woohoo, see that snow on the top of the mountain at the halfway point in the transformation! A few hours left to go, trees puffy with pink and the flowers shaping up nicely too. 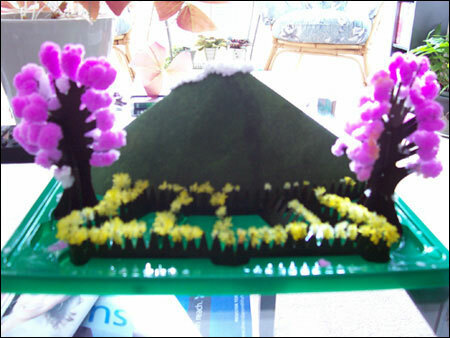 Hour ten, Magic Garden in full bloom as promised and complete with snow-covered mountain. What next? 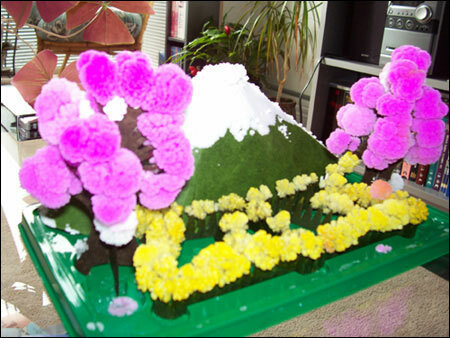 The instructions suggest adding a small amount of water underneath the mountain after two days. Apparently this will result in snow of a more natural colour. The guy at the store told us the garden will remain intact for quite awhile if not poked and prodded. Magic, I suppose, doesn't like to be poked and prodded so I will endeavour to give the Magic Garden the space and respect it deserves. I hope all my fellow Canadians out there had just as magical a Canada Day!